It seems like a real oversight on my part that you all have met Skampy but you haven’t met Mac. This is Mac. Today is his birthday. He’s twelve. He’s in California, living it up with his parents, where he spends half the year sunning himself and dreaming about the squirrels that are running rampant in his own backyard back in Richmond. (You may remember him because he got a shout out when I was in Zimbabwe. Then, it seemed like maybe he was terribly, terribly sick, but then miraculously, he wasn’t and there was much jubilation in America and Zimbabwe.) Today, he’s eating some doggy version of cake two states away from me, and we’re all happy about that. The world is a better place with Mac in it. He is my Fairy God Dog. Probably it is weird to be so attached to a dog that doesn’t technically belong to you, but too bad. He feels like mine, and when I run into other Scotties here in Seattle and talk to their owners, I say, “I have a Scottie back home in Indiana,” and I don’t even feel like a liar. He was the Best Dog in our wedding, and it’s hard for me to imagine he’s not the best dog anywhere. He and I are pretty happy when we get to spend time together. His parents have had a series of Scottish terriers that I’ve been babysitting at their gorgeous home since I was 18. They also had a quirky, incontinent cat that I liked a lot. (Perhaps best not to speak of the pair of lizards that were in my charge one year there.) Mac’s predecessor, Bailey, was the sort of dog who would have been a real reader if he’d only had an index finger to flip pages with, and while he’d sit on the patio regarding the flowers, I convinced myself that if he were a man, he’d be my soul mate. (It is worth noting, Z does have many Bailey-esque qualities.) When Bailey died, I was sure I could love no other dog more than I loved him. What would the point be? But then a few years later, his parents called me to see if I was up for a challenge. They had just found a Scottie puppy they were keen on, but they were about to set off on their travels for several weeks, and the only way they could get this puppy was if I agreed to stay with him. It would be a lot of work, they said, so they’d understand if I didn’t want to. I’d never had a puppy under my care, I knew nothing about helping to train a dog, and I was a little nervous at the prospect. 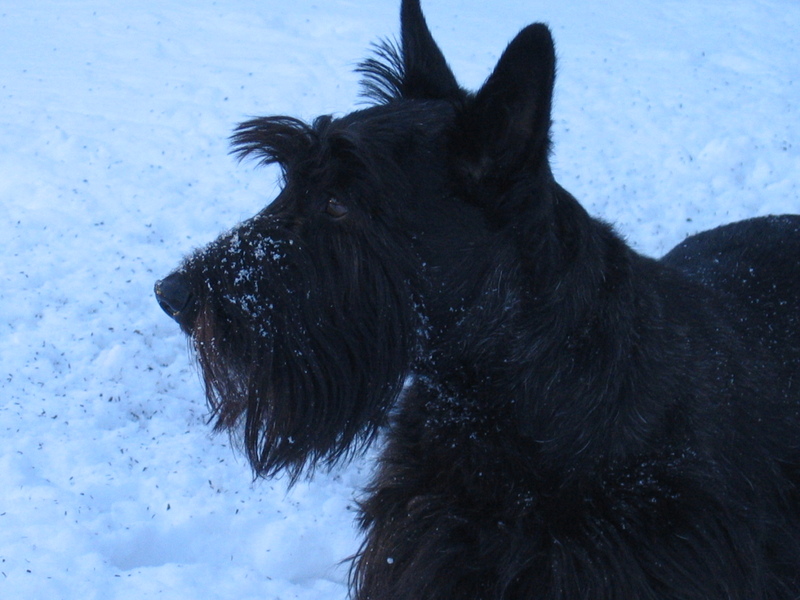 But there was really no answer I could give but “yes.” Have you ever seen a Scottie puppy? He was adorable, there in the underbrush, hiking his leg and tipping over because he didn’t yet have his balance, and I was pretty much in love with him the first time we met. He ate one of my best bras within the first two days I was there. He devoured an entire, unopened bag of beef jerky and then expected praise for being so clever at having figured out how to open it with his little puppy teeth. He’d regularly dart out of the house and into the woods, terrifying me because he’d refuse to come back when called, and then would dash back into the house in his own good time, covered from tip to tail in burrs. He’d lie still while I pulled the burrs from his fur, wagging his tail as if this too was the most fun ever. How could I be mad? I could regale you pages of Mac stories, but I know that might be tedious for you. Whenever I am with him, he keeps an elaborate and entertaining journal about his exploits, so maybe you’ll read about those one day. (I’m ashamed to admit that as soon as I write an entry, I forget that he didn’t pen it himself, so when I go back through and read it months or years later, I’m amused by how clever he is and what a way with words he has.) He’s terribly smart and he has a lot to say. He’s also superb at getting his message across even when I’m not transcribing for him. For example, I once gave him a bowl of water from my parents’ tap. They live in the country and the water is good but extra irony. I settled down in the swing to sip my bottle of Aquafina. Mac sniffed his bowl and then looked at me pointedly. Then at my bottle of Aquafina. Then back to his bowl. We did three rounds of this before I finally cried uncle, upended his bowl, and gave him half of my bottled water, which he lapped up happily. He’s very persuasive. And squirrels live in fear of him. Since I’m making confessions, it’s probably worth a mention that last year I flew home to Indiana expressly to see Mac because I missed him. And this summer, when my mother was babysitting him and she and I were talking on the phone, I heard him bark and I almost burst into tears because it was so good to hear his voice and I was missing him fiercely. You can’t really call a dog on the phone and have anything akin to a conversation. I understand. I have a Cairn Terrier named Harold Digby. We can swap some Terrier Tales. Harry is also terribly clever. One night he woke me up at four in the morning. I assumed it was five or six (when he usually wakes me up to go out), so I was puzzled when I found myself by the back door alone. When I went to bed, I discovered him in my place snugly tucked in under the covers with his head on my pillow!! Little dogs are such entitled personages! Great name, and that sounds completely like what Mac would do. I can’t tell you the number of times I’ve found myself hanging onto the edge of king-size bed while he is happily in the middle.